Ashley Judd as Lorraine Nelson and Harry Connick, Jr. as Dr. Clay Haskett in "Dolphin Tale." Ashley Judd as Carly and Dwayne Johnson as Derek Thompson in "The Tooth Fairy." Ashley Judd in "Crossing Over." Ashley Judd at the Breast Cancer Research Foundation's "The Very Hot Pink Party". Ashley Judd at the 62nd Annual Golden Globe Award. Ashley Judd at the Cartier and Interview Magazine "Celebrate Love" party. Ashley Judd at the Sigma Phi Epsilon fraternity house to talk about the importance of HIV/AIDS testing. 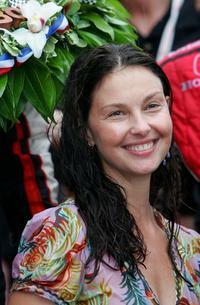 Ashley Judd at the 91st Indianapolis 500. Ashley Judd at the 2006 ESPY Awards. Ashley Judd at the YouthAIDS Benefit Gala. Ashley Judd at the Hollywood premiere of "Come Early Morning". Ashley Judd at the stern star diamond launch to benefit YouthAIDS. Ashley Judd at press conference to announce her new role as the spokesperson for Estee Lauder cosmetics line "American Beauty". Ashley Judd at the 2006 Sundance Film Festival portrait session of "Come Early Morning". Ashley Judd at the 89th Indianapolis 500-Mile Race at the Indianapolis Motor Speedway. Ashley Judd at the Toyota 400 Indy car race at the California Speedway. Ashley Judd at AFI FEST 2006 screening of "Come Early Morning". Ashley Judd at AFI FEST 2006 screening of "Bug". Ashley Judd signing autographs at Kohl's Newport Centre Mall. Ashley Judd at the California premiere of "Olympus Has Fallen."